CCS has a support worker that works specifically with young people aged 18-25. The support worker for Young Adult Carers supports young people, aged 18-25. They might be caring for a parent, sibling, other relative, partner or friend. The worker can offer one-to-one emotional and practical support. This includes helping to sort out problems (for example, around the caring role) or getting back to college, or into work or training; assistance with applying for grants for courses, practical items or activities and breaks away from the caring role; helping carers to access support, training or advice from other services or agencies, such as housing. It may be that a carer wants to talk through how they feel – space to do that can be provided – or a referall for counselling if more is needed. 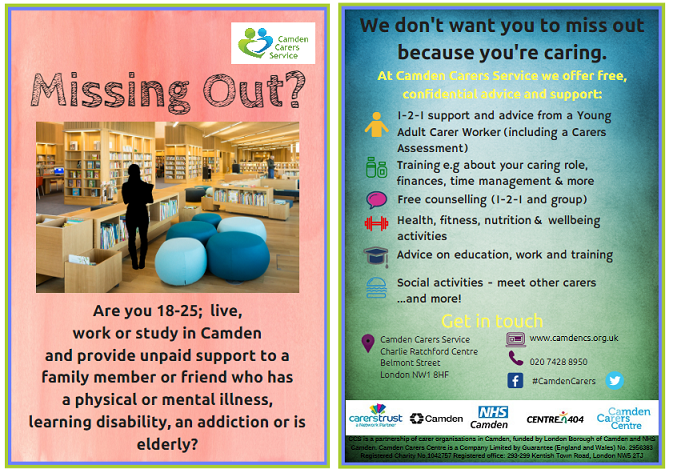 So if you are a carer aged 18-25, and would like to have a chat and discuss what support you need, please ring our main office on 020 7428 8950. Register with us to get the support you need and to access the fantastic events and activities that we host specifically for YACs. Look at our main activities calendar to see what's on or click here to visit our amazing sub domain.